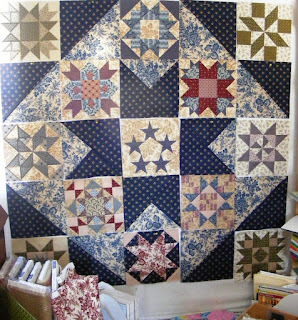 Quilting Adventures: Designer wall Friday ...! Voila! General's Wives - BOM that Fibre Junction is offering! The top is not pieced, yet, but in my defense, I barely finished appliqueing the 5 stars' block late Thursday early Friday! I'm working on having the top pieced and quilted soon. It would be such a great feeling to strike off a project on that long list of UFOs! What a lovely job you did on the applique. How did you get your points so nice and crisp? It will be a stunning quilt when finished. Wow - it's beautiful! I love that five star block - and the colors. Congrats on wrapping up a UFO!!! It will be a fabulous quilt as it looks spectacular on the design wall.